The Dove appearing with an olive branch to signal the receding flood waters has long been a symbol of hope and peace. 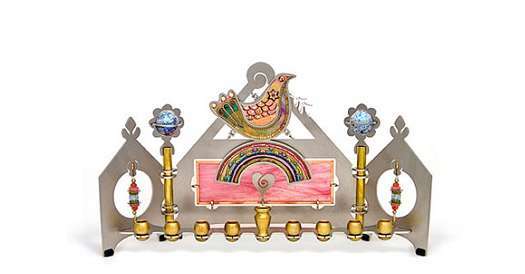 In this menorah the dove is featured perched atop a rainbow. Both are painted in beautiful pastel tones and generously embellished to create a rich centerpiece. Two brass columns on each side support a large flower with a marble core. The intricate design is hand painted within the stainless steel frame. A variety of materials are inserted within and layered with artist’s resin. The Menorah parts are cut to perfectly fit and are assembled using no welding or glue resulting in a beautifully finished piece.